Selling continued in the major market indices yesterday, on significant volume, with the SPDR S&P 500 (SPY) breaking the intermediate trend line and 20-day simple moving average. For further confirmation that the intermediate uptrend is over, SPY should close below the trend line today as well. STR Holdings, Inc. (STRI), a solar related company, had it’s IPO debut at the end of 2009. Currently there is a 23.20% short interest (% of float as of Jan 31, 2011), and it looks like the bears have it right. 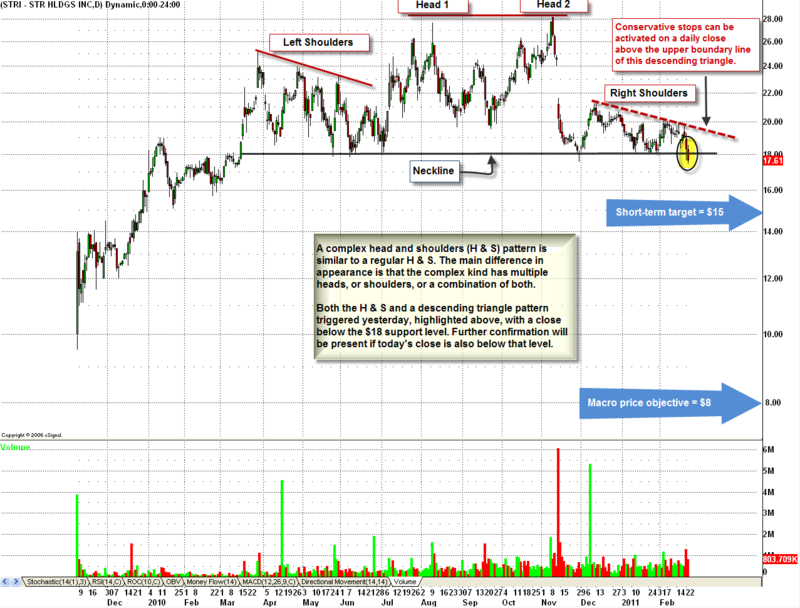 In March 2010, a complex bearish head and shoulders reversal pattern began developing. 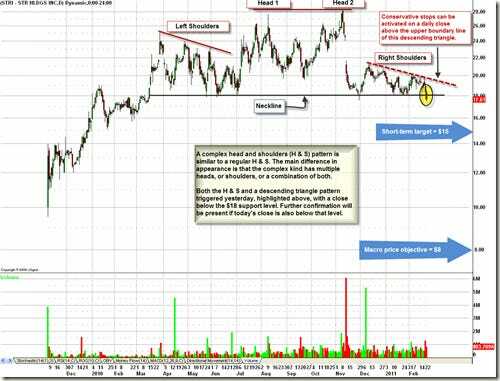 The pattern triggered yesterday with a close below the neckline, which is at $18, and further confirmation of the trigger will be present if today’s close is also below the neckline. A price objective of 8 dollars is obtained by measuring the height of the pattern and expanding lower, from the trigger point, by the same distance. In addition, the right shoulder is a price pattern itself, called a descending triangle pattern, which also triggered yesterday and has a price objective of $15. Targets: short term: $15, macro: $8, Protective Stops: aggressive: confirmed move back above the neckline, which is $18, conservative: daily close above the upper boundary line of the descending triangle. AMX – in regard to this article (from 2/08/11): http://www.businessinsider.com.au/trade-opportunity-in-amx-2011-2 a short triggered yesterday with a close below $55.65 on significant volume. Disclaimer: The information contained herein is not guaranteed. This is not a solicitation of any order to buy or sell. This material is based upon information that I consider to be reliable, but I do not guarantee its completeness or accuracy. Assumptions, opinions and recommendations contained herein are subject to change without notice, and I am not obligated to update the information contained herein. I have a position in AMX, SPY and intend on initiating in STRI. This communication, including any attachments, is for the exclusive use of the intended recipient(s) and/or the intended recipient’s designees. Any use, retention or dissemination by a person other than the intended recipient is strictly prohibited. If you are not the intended recipient or designee, please notify the sender immediately by return e-mail and delete/destroy all copies of this communication.